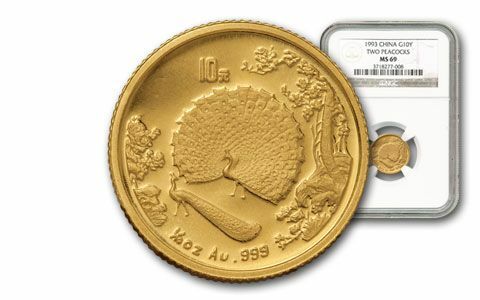 In 1993, the China Mint began a five year series of coins celebrating famous Chinese art. The very first coins feature a painting of peacocks created by the master imperial court painter Lang Shining in the Qing Dynasty around 1700 AD. The coins feature his work "Peacock Spreading Tails," showing the birds in a forest setting on the reverse. 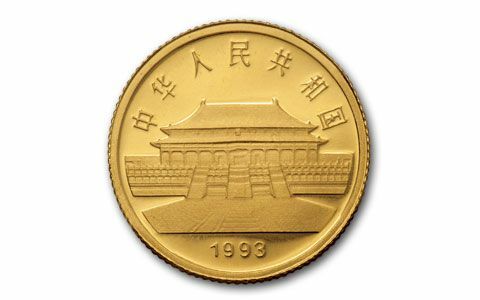 The obverse displays the Hall of Supreme Harmony in the Imperial Palace in Beijing, along with the date. 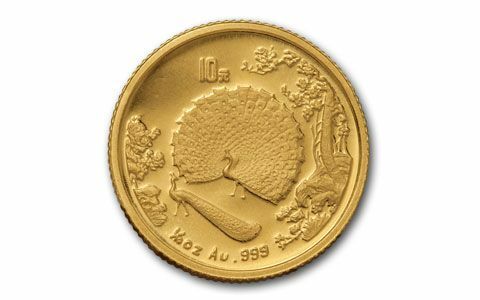 The 1993 Tenth-Ounce Peacocks were struck in 99.9% gold at the Shanghai Mint. 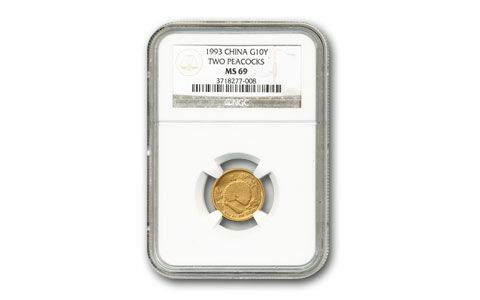 Other 1993 Gold Peacocks have achieved incredible prices, with a quarter-ounce example selling at auction for $4,000! We are pleased to offer you an example of this special coin, graded by Numismatic Guaranty Corporation (NGC) Mint State-69 (MS69). Please don't hesitate to call for yours.